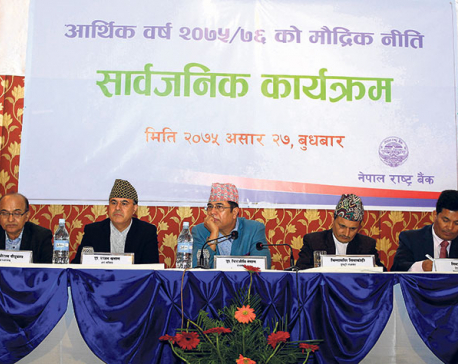 Nepal Rastra Bank (NRB) unveiled the monetary policy on Thursday for the upcoming fiscal year 2018/19 with a focus on checking the skyrocketing interest rates. The monetary policy comes as a sigh of relief for the business community which was finding credits from bank and financial institutions (BFIs) increasingly unaffordable. Other general borrowers, who have taken loans from BFIs under consumer financing category like purchasing of car or building house, were also struggling to service the debt due to skyrocketing interest rates. Many borrowers were on the brink of default due to spiral-like rise of interest rates in last few months while the halt of new lending from BFIs was dampening the private sector confidence. A number of measures have been introduced in the monetary policy to ease the liquidity (fund) in the banking system and tame the rising interest rates. The central bank should be applauded for its initiative in trying to resolve the scarcity of lendable fund which was the major culprit for the surge in lending rates. Intense competition for institutional deposit was also a reason why the interest rates were at an ultra-high level. Cash-starved BFIs used to compete with each other to get the bulk deposit from institutional depositors, driving up interest rates in the market. The monetary policy for the upcoming fiscal year bars a bank from offering higher than 1 percent deposit rate than published rates, leaving a little wriggle room for institutional depositors. Another commendable move of the central bank in this monetary policy is an announcement to lower interest spread rate for banks who have been earning record profits each year. Banks and their shareholders continue to profiteer at the expense of depositors and borrowers, no matter whether there is liquidity surplus or crunch. Moving forward, the central bank should be cautious in the way banks set and charge their interest rates so that they do not circumvent the rule like they have been doing so far. Though there is 5 percent of spread, the yawning gap between deposit and credit rates of banks make one feel that the rule has been almost ineffective. Moving forward the central bank should take steps to eliminate the regulatory arbitrage available to banks so that depositors and borrowers can benefit from this rule. Lowering Cash Reserve Ratio (CRR) and Statutory Liquidity Ratio (SLR) will also help release more funds in the banking sector immediately to ease liquidity. This measure is also expected to decrease the cost for banks and reduce the base rate which is currently tied to lending rate. It however would be too early to expect the interest rates to go down from day one of the new fiscal year. It will take some time—at least one quarter—to see the impact of the monetary policy in the banking sector, or particularly in the interest rates. As the cost of the fund (deposit) for banks may decrease in the first quarter due to these measures, they will pass on their lower cost to borrowers only in the second quarter. So rates of interest are likely to go up if not remain steady in the first quarter of the next fiscal year. But the private sector facing the shortage of lendable fund can tap into the central bank’s concessional refinancing fund which has now been increased to Rs 35 billion. This will help ensure that the productive sector continue to get cheaper financing service even when the interest rates are on a higher side. Thus the NRB looks headed to a right direction in addressing the problem of high interest rates in recent months through its monetary tools. These measures are necessary but not sufficient in putting downward pressure on interest rates. Banks should be prudent in making investments while the government should be doing its bit for the execution of the fiscal policy and for meeting the capital expenditure target. Only then there would be effective transmission of monetary policy in the market and stability of interest rate.